Keratoconjunctivitis sicca or “dry eye” is a condition affecting many cats and dogs, most often older dogs. Some dog breeds are more prone to developing KCS than others: American cocker spaniel, dachshund, English bulldog, Lhasa apso, miniature schnauzer, pug, shar-pei, shih tzu, West Highland white terrier, and the Yorkshire terrier. 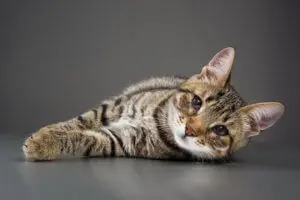 In cats, the condition is most commonly initiated by feline herpesvirus infection and is a result of decreased tear production and changes in the composition of the tear film. Functions of the tear film include providing oxygen and nutrition, removing waste products and debris, lubricating the eyelids, maintaining a smooth optical surface and providing antibacterial components. There are a number of potential causes of KCS; in most pets the cause is not determined. In dogs, the disease is frequently inherited and presumed to be caused by an immune-mediated attack of the lacrimal (tear producing) gland, especially in those susceptible breeds mentioned earlier. Certain drugs, most notably the sulfa-containing medications, may cause KCS depending on the susceptibility of the pet. Neurologic conditions such as facial nerve damage can also result in KCS. Infection and inflammation of the lacrimal gland may cause it to be temporarily or permanently destroyed. Viral infections known to cause damage include canine distemper and feline herpesvirus. Clinical signs are often suggestive of KCS, depending on the severity of the condition. Confirmation is achieved utilizing the Schirmer tear test, which uses a small strip of sterile filter paper to measure tear production. Normal tear production is generally considered to be between 15 and 25 mm per minute. The ultimate goal of therapy is the return of normal tear function. Frequent supplementation with a long-lasting artificial tear is necessary until tear production increases. Topical eye drops such as cyclosporine or tacrolimus are used to stimulate the lacrimal gland to produce tears. These drugs are very effective but are only helpful as long as they are being used. After the initial diagnosis of KCS, topical application of medications may be frequent, but the frequency is decreased as the pet begins to respond to treatment. Although the majority of KCS cases respond well by increasing tear production, the occasional case does not. In such cases frequent medical therapy in the form of an artificial tear every few hours is required on a lifelong basis.